Do you have any tough relationships in your life right now that seem to go out of their way to make your life miserable? Do you have any enemies? How do you respond to them? I unfortunately can admit that many times I have allowed their attacks to affect me personally more than I ever should have. I allowed discouragement, disappointment and frustration to give birth to responses led by bitterness and anger. For me they many times were relationships close to me such as: clients you work desperately to please that are never appreciative, romantic relationships that seem at peace with devastating your world, family members that reject your unconditional love, or dear friends who unexpectedly walk out of your life while attacking your character. It is easy for us to do what I did in response. However, my goal today is to present a case for a splendid alternative. It is my prayer that it would challenge you and become one you would embrace not only now, but for life. Romans 12:17-21 – We should strive to do what is right to everyone. We should not repay evil with evil responses. We should passionately strive to be at peace with all people. We should always remember that vengeance from wrong doing to us is always God’s to claim (not ours). Matthew 5:43-46 – You might have heard the expression: “love your neighbor, and hate your enemy”. However, God desires for us to have an alternate response. He expects us to do the unexpected and show not only our neighbors (but our enemies too) responses of love. He wants us to pray for them. Yes, He actually wants us to pray for their needs, their heart and for their blessing, despite their attacks on us! It becomes a matter of how much we trust in God’s leadership/authority within our life and the world at large. Mark 12:29-31 – This one is very close to my heart right now. I have lived next to a single mother with children for many years. I might have said hello here and there, but I have never done much of anything to truly love this neighbor. Perhaps I have shown love to many others locally and globally, yet I have failed to love one of my next door neighbors. For me, that needs to change now, and I am going to take action to make sure she knows I am sorry, and willing to offer her any help she might need now or in the future. I will seek her forgiveness for allowing myself to go through the motions within my busy life, while overlooking her family when I certainly shouldn’t have. 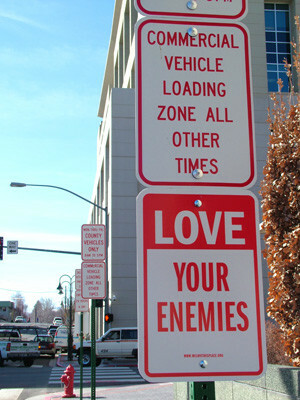 Posted in Spiritual Insights and tagged loving your enemies, loving your neighbors on June 4, 2011 by joesharp.